DianeClehane.com: DOWNTON ABBEY SEASON FOUR: FIRST PHOTO! 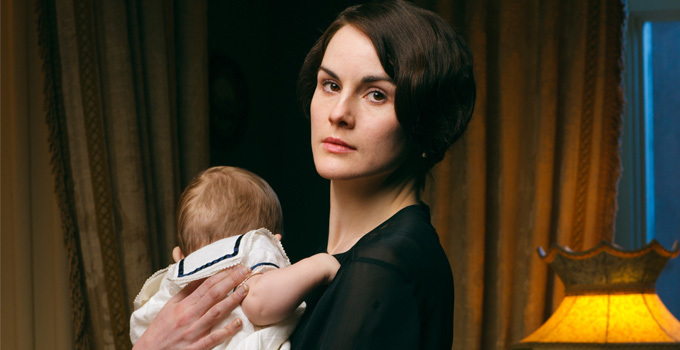 It seems only fitting that this melancholy shot of a weary Lady Mary holding her fatherless son is the first official photo to be released of Downton Abbey's season four. In the aftermath of the shocking season three finale, Julian Fellowes has given many interviews saying that the focus on the upcoming season will be on Mary's journey to find herself again in the face of Matthew's death and as a new mother. The show will pick up six months after the finale and there are several new cast members that will be joining the show. As I reported exclusively in January, Shirley MacLaine will be returning as Cora's mother Martha Levinson. She's sure to have plenty of advice for Mary. More on the new season coming soon!